welcome to THE STITCHING WORKSHOP's website. 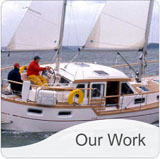 Specialist seat upholsterer for caravans, motor homes, aircrafts, boats and commercial vehicles based in EXETER, devon. Are your caravan, motor home or boat seats and cushions looking tired? Fed up with having to pay big mark-ups on stock fabrics? What if you were able to choose and buy the fabric for your seats and we did the work? At the Stitching Workshop we give you complete control and choice over your precious vehicle's upholstery. What is The Stitching Workshop? The Stitching Workshop is a small specialist upholstery business. The company dates back three decades located in Exeter, in the heart of Devon. We specialise in re-covering old foam cushions and other upholstery needs for caravans, motor homes and boats. We also undertake recovering/refoaming tired conservatory furniture cushions as well as contract upholstery for pubs and restaurants etc. Your materials, our expertise - a special service! Unlike most other upholsterers, we do not shy away from using our customer’s own materials. For instance 90% of our customers prefer to source their own fabrics, while we do the rest. This has the advantage of total control of the project from you, the customer, on both the cost and choice. With this in mind we have put all the details including a list of labour-only prices on this website. 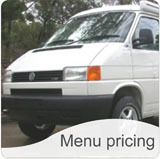 Click here for our labour-only price list. Prefer us to supply the material? No problem. We do supply fabrics however these are limited to ranges of plain automotive velours or upholstery/marine quality vinyls (click here to see examples of our stock fabrics). 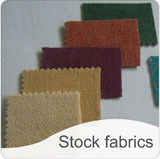 If you are looking for specialised upholstery fabrics (i.e. patterned) you may prefer to look in local fabric shops. If you are prepared with dimensions and know exactly what you want us to do click here for our quote form. Ensure you know what you want from us so we can quote you as quickly as possible to meet your requirements.